For Belgium-based American artist Matthew J. Frock, balance provides the central theme of his paintings. He creates meditative, colour-laden works which draw upon a variety of influences. A: In Aesthetica Issue 88, you note that Zen is the guiding principal of your creative process. Can you elaborate on how it influences your work and life? MJF: We’re going right to the heart of it in the first question. Okay, Zen is certainly the goal. It’s better described as the guiding star as I make my way through my art practice. My work is meditative in that I spend long periods staring into a field of colour, tracking my eye movements and making decisions about how the next mark should look. This process clears my mind or highlights conflicts within, and I find myself managing my mind in the same way I would if I was sitting still and meditating. What I perceive to be the natural aesthetic in my work – natural as in similar to nature – is born out of my understanding of Zen. I won’t hesitate to make big changes mid-painting or even destroy a composition and maybe even paint over it. I disallow myself from making any decision that protects work already made. I try to be true to my instincts. When the mess (or rather chaos), is interesting, I work to hone it and refine it. If I compare my process to a wave crashing on the beach, the initial marks are a fast, sloppy rumble followed by smaller, more calculated mark making until the final layers are applied with careful thought in an effort to bring balance to the final work. A: The art that emerges from your studio is heavily informed by what you are reading and listening to whilst you work. To what extent is the studio a private space? MJF: As we’ve discussed, my work is very meditative, so working alone is ideal. However, I was an art teacher for eight years, so I have no hang-ups about working in front of others or speaking about what I do. The best way I can explain my studio experience is to say it’s like stepping into my brain: it’s a lonely place, but I like it. And I fill it with interesting places and people from history. Lately I’m listening to the The British History Podcast in the mornings and music in the afternoons. Some of my paintings seem to have subconscious imprints on them related to the material I was thinking about when I made them. For me, that makes these paintings fascinating to make because often they end up portraying things I was unaware of during the process. But I understand that I’m probably the only one interested in that aspect, or it seems so anyway when I bring it up. If I’m not listening to John Coltrane, Marc Ribot, Leonard Cohen and Tom Waits to name a few favourites, then I’m sometimes singing and humming to myself as I work. My studio is a great place where I can simply be and not have a concern about appearances; everybody needs one! A: Where is your studio vis-à-vis where you live? MJF: My studio is in a separate building behind my house. I enjoy having my work close by. I don’t need incentive to go work or be removed from the comfort of home. I have more trouble coming home than going to the studio. And I have a tendency to forget things, so it probably saves me time, too. A: Some of your paintings include over 30 colour layers. Does the use of gouache help the process? MJF: I do use the word gouache to describe the paint I make, but it’s totally inaccurate. I say I use gouache because the paint I make looks like gouache, but my paint is better. We have acrylic now, and acrylic is a much better binder. If I say I make an acrylic paint, I don’t think it has the same weight as gouache regarding appearance. My acrylic-based paint is heavily saturated with pigment, like gouache. Differences in the ratio from binder to water and different pigment opacities and solubility allow me to create different affects. I mix my colours in jars, then label them with their contents so I can recreate it. A: How long did it take to create The Grove? MJF: The Grove took a while to make. It’s difficult to measure hours because I work on several at once, but it was in the studio for three months. These paintings usually take between three and six weeks. My first attempts to work in this style were small, so The Grove alongside Forest of the Peacock were the first pieces to scale up. It’s no surprise that scaling up greatly changed the process. I’ve probably learned more about working this way from making The Grove than any other painting. The most important lesson may have been that “more” in the case of these paintings is a good thing. More layers means more complexity and more to see. That being said, I’m presently working on shortening the time it takes to make these. So far, the results may be beneficial in that they are a bit fresher. If I use the wave analogy again: there’s no reason why these paintings couldn’t be finished with one crashing wave; I’ve done it already, but it’s far more common for these paintings to be built from multiple crashing waves. That means multiple restarts and lots of layers. A: How do your paintings portray a sense of both chaos and balance? MJF: I start by making a mess that has interesting features. The messes tend be organic in shape and plain throughout the picture. The layers of colour I apply to bring the painting to balance generate a visual noise. By tracking the way each colour leads the eye through the painting, the composition becomes balanced, however the variety of colours shining within the organic composition have energy and movement. It could be described as chaotic, yet the balance of colour makes it feel complete, like you’re looking at something, but can’t make out what it is. 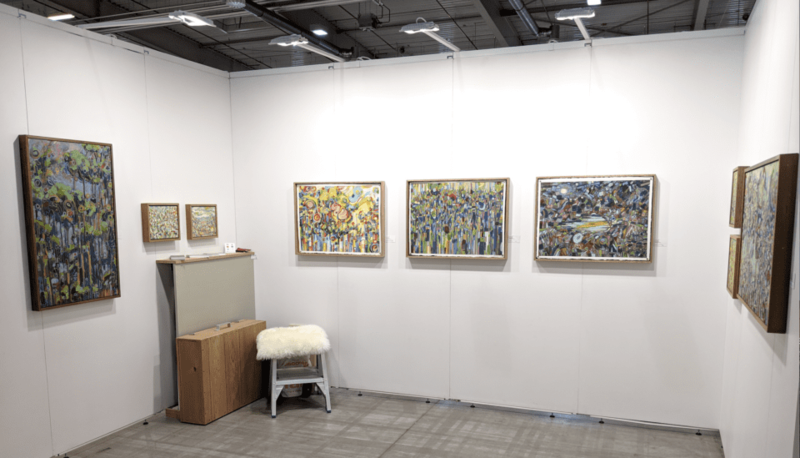 Discovery Art Fair Cologne, April 2019. A: You took part in Discovery Art Fair Cologne earlier this month. How was the experience, and will it inform what you do at your upcoming fairs in the UK and France? MJF: My experience was very good. The public in attendance was knowledgeable about art. The other exhibitors were also of high quality. I’ve been thinking about the price of my art for a while now and my experience and conversations with exhibitors has convinced me that my work is priced too low. So that’s one change I’ll make before the UK fair – my prices will be a little higher. A: How does attending and exhibiting at art fairs impact your art practice – how do you balance the time spent travelling and promoting your work with the time spent in the studio? MJF: I don’t attend so many art fairs in the year that time is an issue; the difficulty comes from the budget. Art fairs are expensive and it can be tricky to rise above the costs. That being said, it’s invaluable to have regular conversations with people who love art and those who make it. It helps to enforce or disprove my impressions of what’s coming out of my studio. So far, I’ve been lucky – everyone seems to like what’s coming out. The criticism I’ve received has been more secondary: I had good advice a while back about frames, so I redesigned my frames; at Discovery Art Fair Cologne another artist was smart to point out that I would benefit from more variety of formats, so I’m working on that now. Matthew J. Frock at art3f Paris 2019. A: How did growing up in the USA help develop your understanding of the natural world? Has this understanding changed since moving to Europe? MJF: I grew up in a house with a nature preserve behind it. When I wasn’t in school I pretty much lived in the woods behind my house. I can recall every little magic spot in those woods. I remember the light through the trees, the insects, the smells, the movement of the stream and how it changed from day-to-day. My sense of spirituality comes from there. Nature was my first teacher and she revealed in countless demonstrations how she works. I never forgot. I still make regular walking trips through the mountains and woods. I lived in San Francisco for five years and that’s the most beautiful city I’ve ever lived in. The East Coast of the USA is for the most part an out of control, hideous sprawl. I avoid it. I enjoy the natural beauty of Europe. For the most part, it hasn’t been overdeveloped. The northern coast of France, the Ardennes, the Highlands of Scotland and Le Tour du Mont-Blanc are the highlights of my European hiking adventures to date. A: What do you have planned for the rest of this year in terms of new work? Sussex Art Fairs (West), 17-19 May at Goodwood Racecourse, Chichester, West Sussex, PO18 0PS, UK. For further information, click here. art3f Mulhouse, 29 November-1 December at Parc Expo de Mulhouse, 120 rue Lefebvre, 68100 Mulhouse, France. For further information, click here. The work of Matthew J. Frock appears in the Artists’ Directory in Issue 88 of Aesthetica. To pick up a copy, click here to visit our online shop. Lead image: Castle Ewan, 2019. There are four days remaining to enter this year’s Aesthetica Art Prize. In the countdown we explore Nathan Walsh’s painted world which in some ways resembles the society we live in. Defying the label of Pop Artist, David Spiller’s latest offering at Beaux-Arts, London, uses colour, form and familiar icons to conjure up memories of the past.